Perfect for a couple of sommeliers, this petite barrel imparts the wine inside with a mellow, oaky flavor. More than just a handsome homage to a couple of wine lovers, this miniature oak barrel ages vino to peak flavor, just like its full-sized siblings found in professional wineries. Its petite proportions accelerate the aging process, meaning that the recipient's choice of vintage will be infused with the barrel's American white oak flavor up to ten times faster. Turn the barrel and taste the contents weekly, and when they reach their ideal oakiness, the amateur vintners can enjoy a glass straight from the tap. Handmade by coopers in Manassas, Virginia. Ages 21+. Before first use, make sure to cure the barrel for 3-5 days, as mentioned in the instructions. Clean with damp cloth; use included Barrel Cleaning Kit periodically as instructed. When not aging liquor, use sterilization powder as instructed. Take care when using cleaning kit - Use Only As Directed - Harmful if swallowed. 2L Personalized Barrel comes with custom barrel and stand. 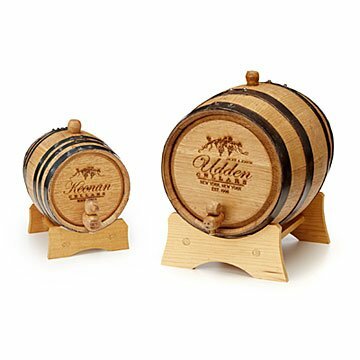 5L Personalized Barrel comes with custom barrel and stand. 5L Personalized Barrel with Wine Making Kit comes with custom barrel, stand, fermentation jug and kit (Cabernet Sauvignon grape), and a cleaning kit. Looking forward to buying one for myself. The barrel is well made, and really makes an impressive gift. The engraving on it looked great as well. My Dad has been brewing beer, and recently began making wine. He uses glass growlers to age his wine. This oak barrel will give him a chance to inexpensively experiment with wood aging, as well as an attractive keepsake. I got the larger barrel and am very happy I did. The writing on the front is really nice. This will look great in our entertainment room. I was surprised at how small the 2-L barrel was, in fact we measured it and calculated the volume, and yes, it is 2-L. Hasn't been given as a gift yet but I think it will be well received. Very pleased. The design is absolutely beautiful. I love the fact that it is fully functional for wine making. I would love to purchase one for myself in the future. It's a rustic, beautiful, decorative, and functional little wine cask that our wine connoisseur coworker loves! It was a great going away present. I purchased this as a gift for my parents' 30th anniversary. They make their own wine, and this gift will make that process more stylish. This looks great and my girlfriend loved it!